The hotel is going 100pct non-smoking The Hampton Inn Roanoke - Hollins/I-81 hotel is located off Virginia Interstate I-81at Exit 146 near Hollins University. We are 5 miles from downtown Roanoke Virginia and 2 miles from Hollins University. There is a shopping mall and restaurants within 3 miles of this Hampton Inn hotel. Whether traveling to Roanoke on business or pleasure our Hampton Inn hotel guests enjoy amenities which include complimentary continental breakfast in-room coffeemaker and TV with cable. Some rooms are equipped with whirlpool tubs. 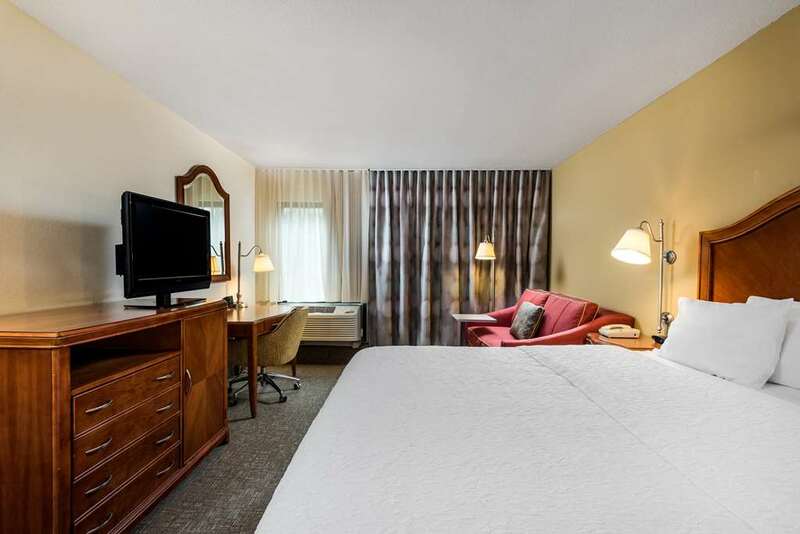 We also offer to our Roanoke Hampton Inn hotel guests connecting rooms cribs exercise gym irons indoor pool and refrigerators. Laundry/valet services guest laundromat meeting/banquet facilities and audio visual equipment are available for a nominal fee. We love having you here in Virginia at the Hampton Inn Roanoke - Hollins hotel.